Yummy and spicy.. Its my all time favourite. Make thick pulp from tamarind for about 1 cup. 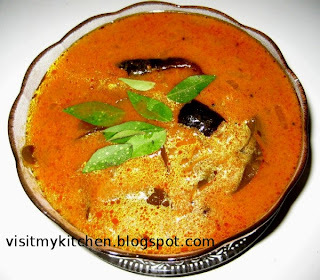 In a tava add a table spoon of oil, temper mustard, red chillis, hing, methi, curry leaves. Once done, add the sambar powder to the oil. Saute 2-3 seconds. The powder will get fried in the oil and immediately simmer and add finely chopped Onion. Saute till pink. Extract the tamarind again, as much as u can out of it adding water for about 2 cups more and add. Let it boil. It will boil well enough and will come down to half its original size.